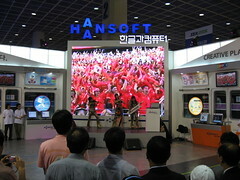 Since I live in Seoul, I was tipped to go to SEK a large tech exhibition in Korea. I meant to go to Linuxworld trade show earlier last week for my conference fix. Though the ticket prices were over 100USD! I expected it was one of those “Linux roadshows” aimed at the big boys. Though I am a bit disappointed my employer didn’t get involved. Damn my conference experiences have been mixed. A paper of mine was accepted for a mobile business conference last year. Though since I was travelling around Asia and not in the employment of anybody, I could not afford to pay the conference fees. I recall something like 1000AUD. Beggar’s belief considering it was a personal contribution and I was invited to speak. Well, I was all excited about SEK2006 considering all the “Korean innovations” that get covered by places like engadget and The Register. One John Oates is covering the event for the The Register, though I didn’t bump into him. This time my employer allowed me to wander around last Friday. First off the venue is huge, although there isn’t much there. So it is like some Expo where one quickly feels tired just wandering around. I couldn’t find any good English maps, so I really did just have to wander around. One particular company I am interested in Haansoft was easy to find. Though they had an awful live event with some girl band was performing. So loud. I immediately felt drained! So I walked elsewhere. I later returned to see demo their interesting Office application. They have a mobile version of their Office product too. They have designed a service to send an office document to a mobile’s number. Though the document needs to be “converted” to a special “mobile format”. Hmmm… Looked good though. I am surprised their office product so much like MS Office, down to the widgets. I checked out LG and Samsung. Damn the girls there are hot, but I can’t help think that “Booth Babes” are sexist and degrading. I mean really. These girls are obviously models who have been trained to demo various gadgets. There are two problems with this. They are rarely able to speak any English or “tech”. The little things to keep attendees entertained like hiring artists to do caricatures is just boring. I want to meet technical people. Damn, I’m in the wrong exhibition! They had a couple of robots there. But they’re just glorified puppets. Really. There isn’t much intelligence there. There was a lot of DMB stuff there. I ask one DMB chip manufacturer if there were Linux drivers. In broken English she replied yes, but no “WinCE”. Like I care. :) Though the couple of USB DVB electronics consumers I met, say “No Linux”. Frustrating. I came across one agonising Korean company called Netpia. They seem to a misguided “Realnames” outfit. Doing unicode mapping to domains. Why-oh-why. They the argued the international URI standards aren’t sufficient because they need www. and .com. PLEASE! A lot of Korean research seem devoted to video streaming. I think this is misguided too, but of course I couldn’t find anyone to debate with. Youtube and Google video don’t stream, they progressively download. 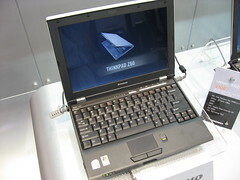 Finally I had the joy of visiting the Microsoft stand and playing with Vista! The machines they had there were top of the line and still it crawled along. HAHA! What a prize piece of bloatware. I couldn’t see anything there particularly cool except the “network map” which failed to work.